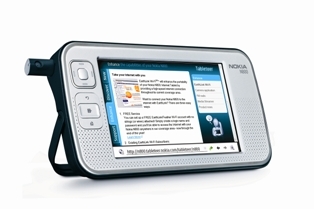 T he Nokia N800 tablet is an exciting example of what communications technology can and should be. I was sent one from the company to try and to be honest I didn’t expect to be impressed. When I started using it I was blown away at the fact the device is about the size of my smartphone yet is about as powerful as my laptop. The screen is 640x480 and you appreciate the ability to read full web pages at this resolution. Unlike my laptop it actually has better speakers and surprisingly can stream audio, video, play Flash (including YouTube) and even videoconference via its embedded camera which can rotate. It is truly an ideal device for web surfing and light typing. With a bluetooth keyboard you can use this device as a primary computing platform. But enough on this device… Let’s talk about WiFi as Nokia has teamed with EarthLink to offer free WiFi to N800 users in certain cities for free. If you are lucky enough to have an N800 and live in Philadelphia, New Orleans, Corpus Christi, TX or Milpitas or Anaheim, Calif. you can take advantage of this offer.